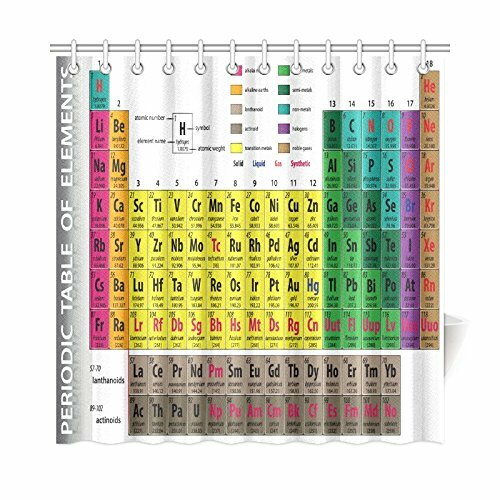 Periodic Table Shower Curtain Hookless - EnaEzen Periodic Chart Kids Science Educational Shower Curtains Hook Less for Bathroom Mold and Mildew Resistant Waterproof Fabric 71 x 71 inches Periodic Table of Elements Shower Curtain / Kids Shower Curtain / Science Shower Curtain Art: Periodic Table of the Elements Item Features: - 【HOOKLESS SHOWER CURTAIN 】 It doesn't need hooks or rings. So convenient to hang up. 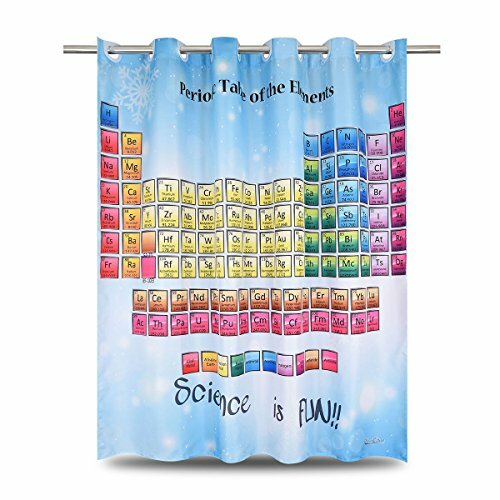 - 【UNIQUE DESIGN】 Educational shower curtains for kids. 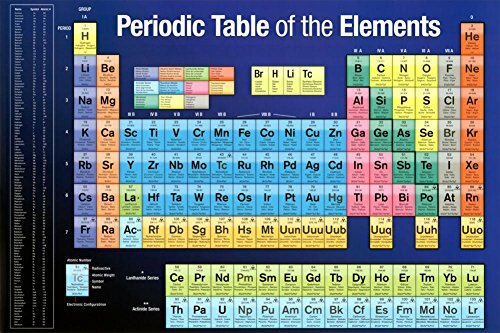 Great gift for people who love science,periodic table of elements. - 【DETAILS UPGRADED】 4 layers technological fabric. The material looks the same as others but is different. - 【HEAVY DUTY MATERIAL】160g/㎡ high quality polyester fabric, very thick. It will not see through. (normal in market is 90g/㎡) - 【WATERPROOF AND MILDEW / MOLD RESISTANT】Nanoscale waterproof technology, real mildew resistant fabric shower curtain keeps water droplets inside. - 【MACHINE WASHABLE】 Item Details: Material: 100% polyester Heading Style: Hookless (no need hooks or rings) Dimensions: 71 in H x 71 in W (180cm x 180cm) Package Includes: Shower curtain * 1 Washing Instructions: Machine wash in cold water, delicate cycle. Do not bleach. Tumble dry low. Do not dry clean. ********** Design ********** The most prominent feature of our product is customized. This InterestPrint shower curtain combines with unique design reveal the fashionable elements and creactive charm. Custom design will be a eye catcher. We believe you will receive many compliments when you get it. ********** Material ********** Designed for standardized bath tubs, fitted with C-shaped curtain hooks. Tough durable waterproof polyester fabric, preventing water from splashing out of the shower stall. ********** Print Technology ********** One-side printing, using heat dye sublimation technique, long-lasting effects. Easy cleaning, machine/hand washable in cold water. Air dry. Decorate your home and add a highlight to your restroom with this unique high quality bath shower curtain. It also will be a best chioce to give this item as a gift at festival time, parties, housewarmings and birthdays. 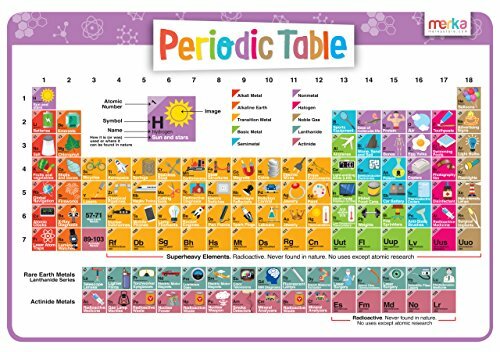 Educational learning Kids Placemat 17x12" ★ Designed by Teachers are a great way to put some fun in the table and make it look AMAZING! ★ These placemats are made out of high-quality materials and full color impressions that create a vivid and cheerful atmosphere around the table. ★ Whether you are eating outdoors or indoors, these Kids Placemats are a perfect way for our little ones to learn while they eat. What's your risk? ★ Nothing. If you are not happy with our product we will refund 100% of your money. ★ Our products are always backed by 100% Money Back No Question Asked Guarantee! Get this beautiful Set of Placemats today. You will not regret investing in the education of your child Click the Add to Cart button now and get your very own Kids Learning Placemat TODAY! New and updated with 11 additional substances. Now includes drug classifications. 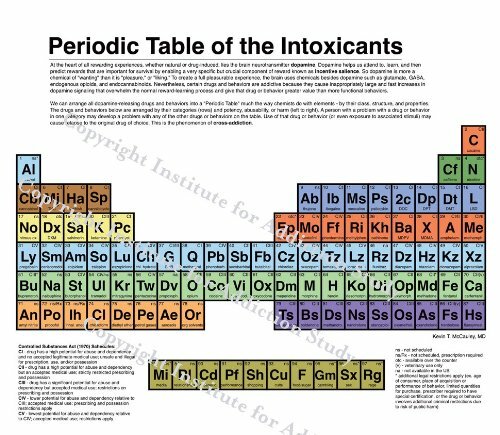 "The Periodic Table of Intoxicants" was first introduced in our award-winning DVD "Pleasure Unwoven," this easy to understand chart lists all the known chemicals and behaviors that cause addiction. 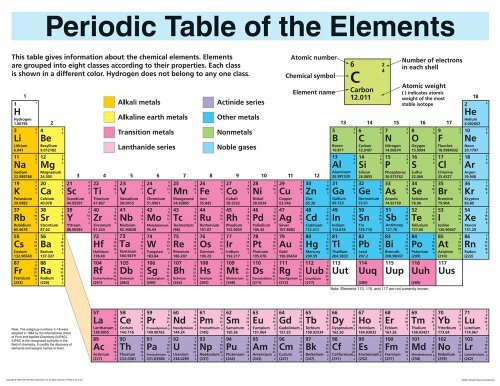 Created by Kevin McCauley, the design mirrors that of the traditional periodic table of elements with addictive substances grouped according to their classification. 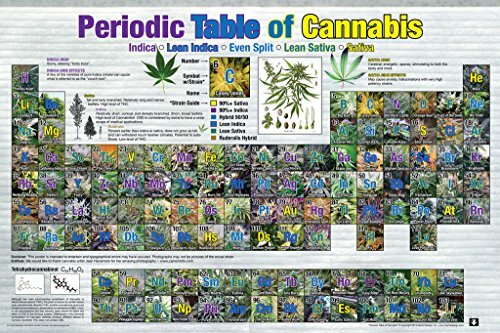 With its colorful and eye-catching design, the "Periodic Table of the Intoxicants" is an excellent educational tool for anyone interested in the disease of addiction such as professionals, students and families. 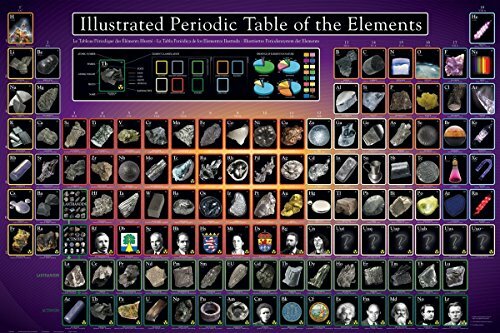 This periodic table of elements poster displays all 115 known elements. 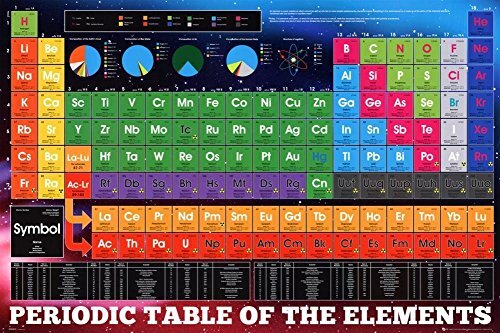 Sized for classroom use at 36" x 24" this poster is made of heavy coated paper. 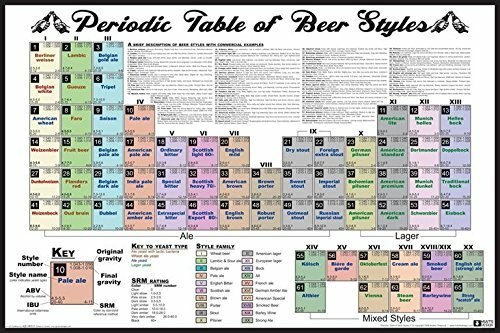 Compare prices on Periodic Charts at ShoppinGent.com – use promo codes and coupons for best offers and deals. Start smart buying with ShoppinGent.com right now and choose your golden price on every purchase.